﻿ M4V iMovie Solution - How to Solve Can't Import M4V to iMovie? Home » video » How to Solve Can't Import M4V to iMovie Issue? Convert M4V to iMovie DV, MP4, MOV so as to successfully Import Various M4V files to iMovie. Maybe many of us have encountered can't import M4V to iMovie. The following article will explain the reason why iMovie won't import M4V files as well as provide the solution on how to successfully import all kinds of M4V movies including handbrake converted M4V, downloaded M4V, non-Apple produced M4V and etc into iMovie. Why Can't Import M4V into iMovie? Reason 1: iMovie will not import movies with extra tracks such as a chapter track, if your M4V files contain extra tracks, iMovie will refuse to import. Reason 2: M4V is a container video format which may encode with a variety of codecs like H.264, MPEG-4 and etc. If the M4V files are using the H.264 codec which is not meant for editing, your iMovie will fail to import those kinds of M4V movies, let alone to edit M4V in iMovie. How to Successfully to Import M4V to iMovie? In order to solve iMovie can't import M4V video issue; a recommended solution is to convert M4V to iMovie more compatible video format. 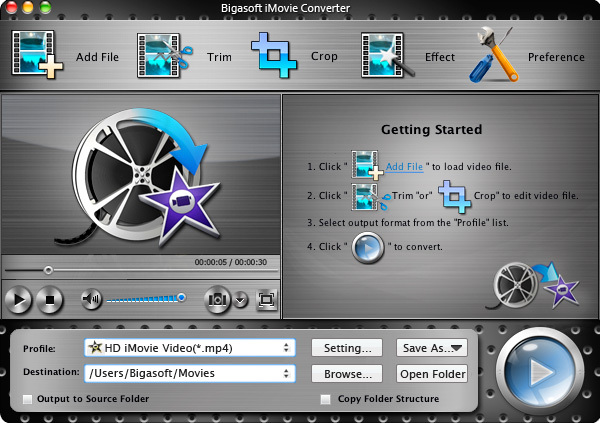 Bigasoft iMovie Converter is just the right M4V to iMovie Converter app which can fast convert all kinds of M4V to iMovie supported MPEG-4, MOV, or DV for successfully importing M4V to iMovie. Aside from converting M4V to iMovie, this ideal M4V iMovie Converter also helps to convert iMovie unrecognized MP4, MOV to iMovie format, convert AVI, MKV, WMV, MPG, FLV, VOB, MXF, WTV, SWF, 3GP and etc to iMovie friendly format. Free download, install and launch the professional M4V into iMovie conversion software - Bigasoft iMovie Converter for Mac, the following main window will pop up. Click "Add File" button to import the M4V movies which can't imported to iMovie. Click "Profile" pull-down menu to select iMovie more supported format like "iMovie Video MPEG-4(*.mp4)", "MOV - QuickTime(*.mov)", "DV - Digital Video Format(*.dv)" and etc. Click "Browse..." to set the destination folder for the converted M4V files. 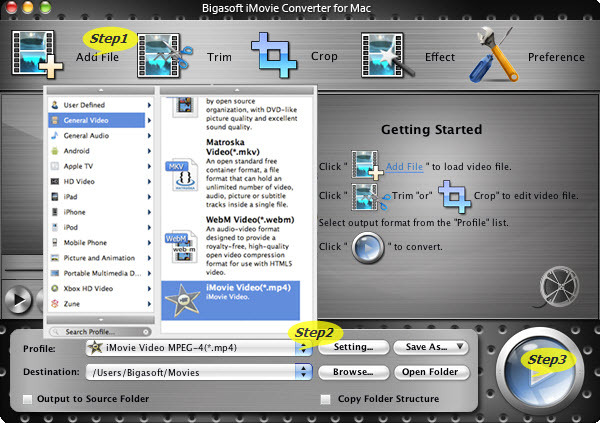 Click "Convert" to button to start and finish converting M4V to iMovie more compatible video format. After the conversion is completed, simply import M4V into iMovie by choosing File > Import > Movies..., then it is just easy to edit M4V in iMovie.